Fencing is important for a number of reasons but often it’s simply used to either keep people or animals out, or keep them in. Fencing acts as a border for gardens and private land, with a range of styles and designs to create an aesthetic appeal at the same time. For domestic use, fences tend to be decorative for the front of your home and large borders in the back garden. With a fence, it all depends on what application it will serve to how it looks. The benefits for home wooden fencing will vary for many properties depending on what need it must serve. Fences act as a border to our homes and with an installation you’ll add security to your home and prevent easy access to your back garden. Back garden fences are traditionally around six feet high, which instantly makes it harder for intruders to gain access. Decoration isn’t seen as important, although there are many styles to choose from. And of course, over time you can paint the fence for a redecoration purpose. Decorative fences or wooden picket fencing are often most appropriate for the front garden, where security isn’t as paramount. Instead, you’re more likely to opt for a front garden fence specifically for decoration and to add something different. 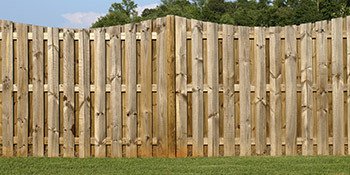 They won’t be particularly high and wooden fence posts are normally spread out, rather than appearing as a solid block. Keeping animals in or out of your property is another popular incentive for having a new fence fitted. Dogs in particular are prone to escaping, so solid, sturdy wooden fence panels is a necessity to keep them in. In a similar way, the fence will keep other people’s animals out. If you’re after cheap wooden fence panels and want to ensure the best price from a quality professional, you’ve come to the right place. By completing our quick form we’ll supply you with up to four FREE quotes from local, vetted and reputable companies. Helpful suggestions about who to contact. The below information indicates the energy performance of properties in Uk. Energy ratings range from A to G, with A being the most energy efficient and G being the least efficient. The Energy Performance Certificate (EPC) rating comes into play heavily when trying to sell your home, as possible buyers will see what amount they're probably going to be spending on their heating expenses. Home upgrades including insulation help to substantially improve a home's EPC rating. The data beneath indicates the various types of properties in Uk. The most common properties all around the United Kingdom are detached and semi-detached properties. Other kinds of homes include terraced houses, flats, converted flats and bungalows. The data beneath offers an indication to the number of households in Uk which are central heated and non-central heated. Properties are heated by a range of sources which reflect how pricy yearly energy bills will be. Types of central heating include gas, electricity, oil, solid fuel and LPG boilers. Changing the way your home is heated can see you with cheaper bills. The information below illustrates the spread of households heated up by different fuels. Throughout the United Kingdom the most frequent by far are gas heated homes, followed by electricity and then oil. Biomass central heating boilers are also increasing in popularity, heated by renewable products like wood pellets or agricultural waste.|Properties in the UK are warmed by a variety of fuels, including gas, electricity, oil, solid fuel and LPG boilers. Each fuel has a varying cost associated with it so you may find yourself with more affordable energy bills by altering how your home is heated. Even solar thermal panels are being regarded as by many people in order to cut heating bills for the years to come.